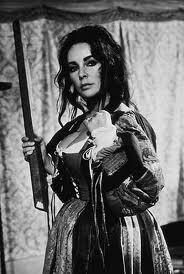 My first real memory of Elizabeth Taylor is from watching her and Burton in The Taming of the Shrew, which my parents had us watch for a family film night when I was in middle school. We'd been doing the Kenneth Branaugh Shakespeare movies and had begun branching out after we ran through them all. I was bowled over. I suppose I must also have seen National Velvet at some point during youthtimes, but I can't really remember it--I wouldn't have watched it on my own, but my sister was a horse person and so Mom would have rented it for her for sure. Eiiiither way: that's hardly the point! The point is, from my preadolescent love of Katharina onward, Elizabeth Taylor has been one of the coolest in my mental logbooks. Now, unfortunately, she is no longer on the planet. But in my logbooks she stays! I also wanted to share a clip of John Waters, who is also on my list of loves, talking about Liz Taylor and a movie she made with Burton in the Sixties called Boom!, which is a film version of a Tennessee Williams play called The Milk Train Doesn't Stop Here Anymore. Waters describes it as "the ultimate drag queen role" and his entire take on the play is amused and amusing, about how drunk everyone was and how over the top it is, but it's so, so clear that he is presenting it with love, that he loves her, and I feel the same way and enjoyed his take on things. This is not meant (by me or Waters) with any disrespect...I just, y'know, don't really have anything new to say about Butterfield 8 or Cat on a Hot Tin Roof, so why not clear that arena for the pros and go elsewhere? He starts talking about Boom! around 1:30, if you don't feel like listening to the EGS professor talk about John Waters. There are three more videos of the ensuing discussion, but things sort of veer on and off of the topic of the film throughout it. I had to make both videos tiny in order to fit them onto my page layout...with the Waters one that doesn't really matter, since you're just listening to him anyway, but if you want to just go to the Youtube page for the trailer it's here.